Dog Days Midtown is located off Monroe Drive just north of the GA-13 and I-85 in the Armour Yards Community. Our Midtown Atlanta location offers pet owners a fun and safe dog day care and dog boarding environment that your dog can utilize as an outlet for energy. We believe consistent interaction and attention to dogs is vital for making happier pets. Furthermore, we believe a smaller dog daycare and dog boarding facility creates a more intimate environment, where special needs can be met and unique personalities recognized. By taking fewer dogs, we can guarantee proper supervision for each individual pet. We offer play-all-day dog day care, luxury dog boarding and dog grooming services, as well as unique accessories, and all-natural and/or organic dog food and dog treats. All this while you watch your dog play all day on our state-of-the-art web camera! Jessy Vaughan has been the General Manager of Dog Days Atlanta's Midtown location since December 2017. Prior to joining the Dog Day's Family, Jessy grew up in Charlottesville, VA and graduated from the University of Virginia. 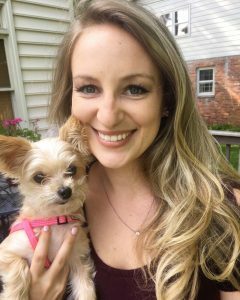 She currently lives in Decatur, GA with her husband and their Morkie, Molly. $48.00 per 24-hour period – includes day care, special feedings, administering medication, etc.